This aromatic spray brings instant relief to tired, hot and swollen feet. Menthol produces an immediate cooling effect on the skin and works as a local anaesthetic to ease pain and reduce irritation. Refreshing Peppermint, astringent Witch Hazel and purifying Ti-Tree, known for their anti-fungal and antibacterial properties, work to alleviate swelling and protect skin from infection. 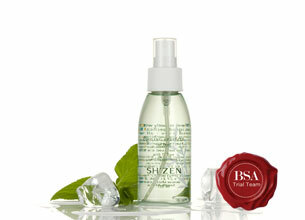 Spray as frequently as required for an invigorating and calming experience that has long-lasting benefits. Availability: Please visit http://bit.ly/1cBH97o for further information on Sh’Zen consultants. This is my favourite product during those hot Summer days. Nobody likes sore or irritated feet, so basically this is a holy grail product to stop any irritation you may experience. I have a bottle in my car, as well as a bottle next to my bed because it just makes my feet feel so lovely and cooled down. As soon as you spray this refreshing spray on feet, you can get a peppermint scent which makes you feel so relaxed. Every girl needs this after a night in killer heels or a long day at work, because it really helps instantly. This is one of those products you NEED to buy! It’s a refreshing spray for hot, tired feet and relief is almost instant as the tea tree oil penetrates and cools down tortured toes and soles. I often use this in summer as I like to sleep with my feet out of the bedding and a bit of foot mist and the “mozzies” leave you alone. I have even stood under the mist and sprayed myself as it keeps the mosquitoes away – they don’t like tea tree :) As an extra bonus, it is a great antiseptic, so it can be used on scratches and bites for immediate relief. This product should be in every medicine cabinet. This is a lovely product that immediately brings relief on a hot day. Your feet will feel cool and revitalised with just a quick spritz. I wish I had this when I was pregnant! The only negative, is the high price tag. I feel it is a bit steep for a foot spray.